Shows this week take on serious issues, including the musical RENT at Shea's (HIV/AIDS, drug addiction, homelessness) and PARADE at American Repertory Theatre (Anti-Semitism, lynch mobs), and AFTER THE FALL (the Holocaust, the stock market crash). 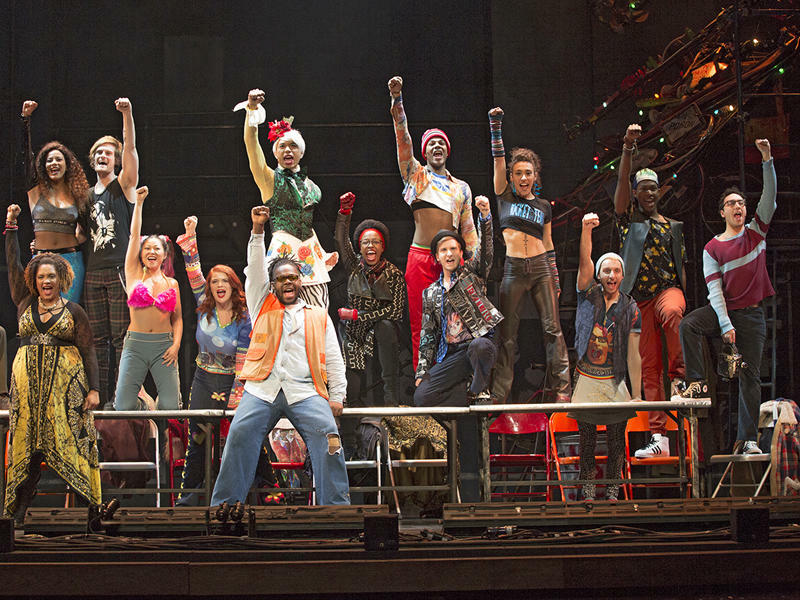 The intrepid cast of RENT at Shea's almost all born after the 1980s HIV/AIDS crisis depicted on stage. PYGMALION, comedy by Shaw presented by Niagara University Theatre, directed by Doug Zschiegner. Mar 28-Apr 1, Thu at 7, Fri at 7:30, Sat at 2 & 7:30, Sun at 2, Mon at 7. Leary Theatre, Clet Hall, NU campus (286-8685). THE SECRETARY, comedy by Kyle John Schimdt presented by The Brazen-Faced Varlets, directed by Lara D. Haberberger, starring Heather Fangsrud, Stefanie Warnick, Davida Tolbert, Jeannine Giffear, Jamie Nablo, Caroline Parzy-Sanders. Mar 29-Apr 6, Fri & Sat at 8. Plus Apr 13 at 8 & Apr 14 at 2. Alleyway Theatre’s Main Street Cabaret, 672 Main St. (598-1585). MILLION DOLLAR QUARTET, musical presented by Musicalfare Theatre, directed by Randall Kramer, Andrew J. Reimers, Joseph Donohue III, Brandon Barry, Nick Stevens, Jeffrey Coyle, Arianne Davidow. Mar 30 at 8 & Mar 31 at 2. Shea's 710 Theatre, 710 Main St. (1-800-745-3000). RENT, touring production of the Broadway musical presented by Shea’s and Albert Nocciolino. Through Mar 31,Thu at 7:30, Fri at 8, Sat at 2 & 8, Sun at 2 & 7. Shea’s Performing Arts Center, 646 Main St. (1-800-745-3000). www.sheas.org Listen to a conversation with Dance Captain Sean Ryan. Have you seen the titles "Dance Captain" or "Swing" in your playbill at Shea's? Wonder what those jobs are? UB alumnus Sean Ryan is in the current tour of RENT at Shea's and explains it all. Sean Ryan in RENT this week at Shea's talks about life backstage and his three favorite things about Western New York (hint: they're all food)! In the past several years a number of city-based theatrical companies have had to contemplate a move (some several times) including American Repertory, Buffalo United Artists, Road Less Traveled, and Second Generation, but it's happening in the suburbs too, to MusicalFare (several years down the road) and now the Lancaster Regional Players at the Lancaster Opera House.